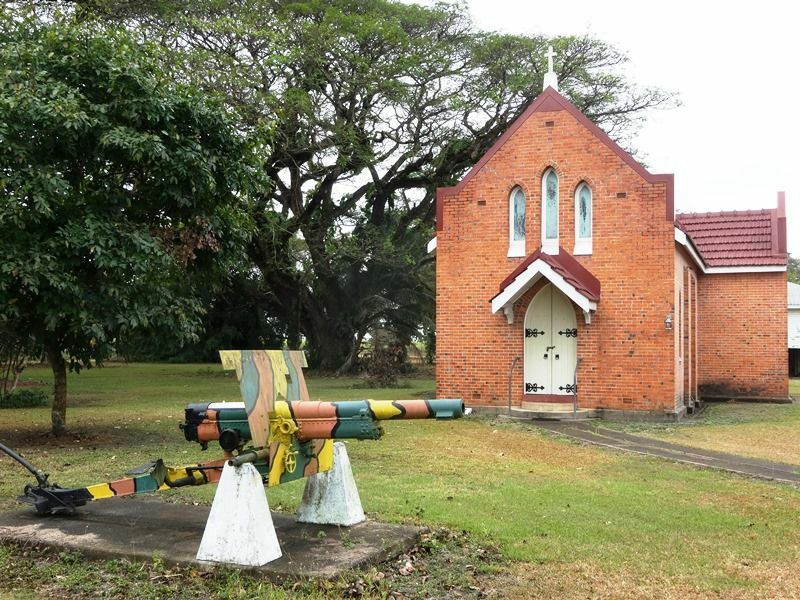 The All Souls Anglican Memorial Church was built in 1922 on land donated by the then Colonial Sugar Refining Company (C.S.R) manager to commemorate the eleven residents of Victoria Estate who died in service or were killed in action during World War One. Queensland has reason to be proud of her many tributes to her fallen soldiers, and in most cities, towns, and hamlets are to be found lasting edifices in honor of them, but the little chapel at Victoria, Ingham, is a particularly fitting and appealing recognition of the bravery, devotion, and sacrifice of our soldiers. It is erected in honor, and in sweet recognition of the boys who enlisted from Victoria Estate, Ingham, and went forth on that great adventure. It is a lasting monument to the boys who never came, back, who lie in the lonely valleys of Gallipoli or the tragically packed grave yards of France and Flanders, and that they live on in the hearts of their native hamlet, this beautiful little church bears devoted testimony, and so long as its cross stands facing the light, so will the memory of those sons of theirs live bravely on. 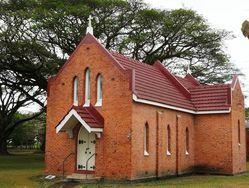 The chapel is of rich red brick, roofed with deeper colored tiles. The plans of the building were prepared and gracefully presented to the committee by the well-known architects. Mr. George Sydney Jones, of Sydney, while the building was carried out by Messrs. Gordon Scott, Arthur Edwards, J. Burnett, H. Ball and C. Harvey, and both the architect, and the builders have every reason to be proud of their work. Inside the chapel is beautifully fitted with glorious Queensland maple. The high ceiling is mitred and of exact and finished workmanship. This Queensland maple is a beautiful wood, and it is impossible to convey the delightful finish its use in this church gives. In our reverie of this appealing little church the copper tablet mounted on a black slab of marble stands out in strong appeal. A small copper plate which carried the names of the Victoria boys who had died so that we and the whole world could stand proudly with high hearts and eyes to the sun. Eleven names are inscribed on that tablet. The names of 11 splendid youths, who will live for ever. It is only a small tablet, with the names cut deeply in, with grim engravers exactness and precision. Yet it has been washed a thousand times by countless tears, and burnished by pride, gratitude and hope. The tablet contains the following inscription:- ALL SOULS: This church in built to the glory of God and in affectionate memory of residents of Victoria Estate who fell in the Great War. Alm, Leslie Henrik. Alston, Rowland Evelyn. Barnes, Frederick John. Beatts, John Ellendoff. Cummlns, Arthur Reginald. Hembrow, Henry Edward. Kelley, Walter Edward. Markey, William. Rankin, William Edward Dunhill Ross, Percy William. Skinner, George Roderick. Excerpt from Townsville Daily Bulletin (Qld), 6th December 1923.